1) Put the ground veal meat in a big bowl, season with salt, pepper and oregano. Mix in the egg and grated parmesan cheese. 2) Pour the milk in another bowl and the bread crumbs, mix well. Add this mixture to the meat and mix everything until smooth. 3) Powder your hands with some flour, so the meatballs won’t stick to them. Form the albondigas until all the meat is used. 4) Put the meatballs in the tomato sauce and simmer for 15 minutes over medium-low heat, until they are cooked, adding water if the sauce becomes too thick. 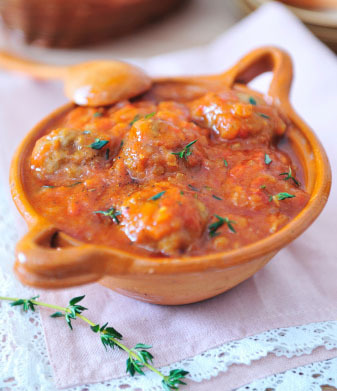 Serve these albondigas with mashed potatoes, spaghetti, or salad, as you like.